Valve's popular Steam software is being given an in-game browser, meaning you can duck out of the action and take in a little internet without the fear of crashing out. Steam, which brings game downloads, multiplayer gaming and media, was built on the back of the success on the back of Half Life 2 and Counter-Strike, and has become a powerful force in PC gaming. The introduction of an in-game browser following a successful beta trial will be welcomed by many, taking away the need to alt-tab out of a game to surf. Shift+Tab will bring up a Steam overlay which will allow web access. The PC's multitasking capacity gives it a much-needed advantage over the increasingly powerful online presence of console gaming. 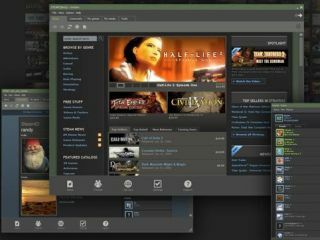 Valve has long been a champion of the PC as the best gaming platform, and its efforts with Steam have offered the equivalent of Xbox's Live or PlayStation's online service. The in-game browser is expected to become an increasingly prevalent feature, with people keen to remain internet-ready even when they are mid game.